When Caitlyn was younger and invited to birthday parties, shopping for a gift was pretty straightforward. I'd set a budget, we'd talk a little about a theme and then go to the book store. She didn't always choose a book for her friends but Barnes & Noble does have a ever changing collection of activity books and small toys; it was a system that kept things fairly simple and contained. No popping indecisively in and out of stores, minimal distraction from other items that maybe weren't right for the birthday person but just perfect for Caitlyn. Not to say that we won't ever go gift shopping this way again, but Caitlyn's also of an age where it's not unreasonable to ask her to make a gift, to invest a bit of herself on behalf of her BFFs. So when a certain friend announced a birthday party, a friend who has handmade gifts for Caitlyn in previous years, I told Caitlyn that a handmade gift was the way to go. 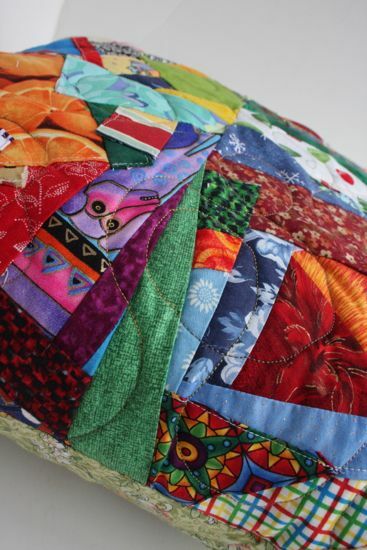 Because her friend is obsessed with Little House era stories, Caitlyn and I agreed on a crazy quilt. Handmade, from scraps, just like Laura would have done (but with a sewing machine and a steam iron). To keep it to a non-intimidating size, we made it a pillow. I worked hard at not taking over the project and also at not abandoning Caitlyn to something she wasn't feeling confident enough to tackle on her own. She picked out the fabrics, placed them on our foundation squares, and did all the ironing. When we were sewing with my machine at home, she sewed many of the seams. When we were working while at Stash, I did the sewing (the shop's machine is a bit intimidating if you're even slightly concerned about sewing through your fingers). I sewed the four blocks together, and quilted the top. 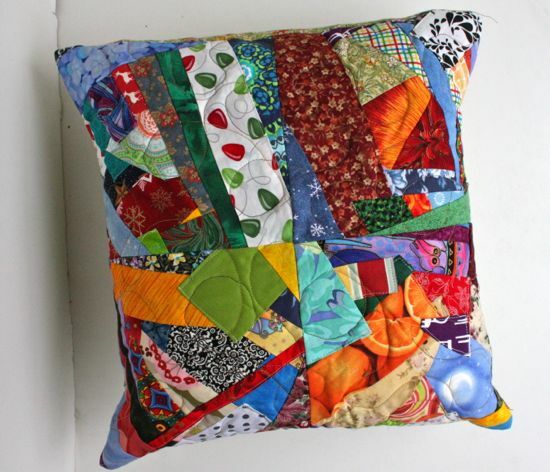 She helped with sewing the backing on; I serged the seams; she turned it right side out and pushed the corners out; I stuffed the pillow form inside. I'm really pleased with how this came out and how we truly did this project together. Caitlyn said she enjoyed making the pillow (although she hasn't asked to make another). And I think her friend likes the pillow, too. What a great idea and how great that she has a friend you know will welcome a hand-made gift. You guys did an awesome job!